We are in Imbolc time. It is time to celebrate that days are becoming longer, weather is warmer and earth is coming to life again. Everywhere you can see snowdrops and daffodils growing, animals start the mating season and life is coming back. 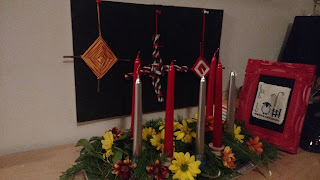 I like to prepare some Imbolc decoration at home, as a solar disc and a Brigit cross. I did this year two cross stitched decorations. One of them is a freebie design from The Primitive Hare. 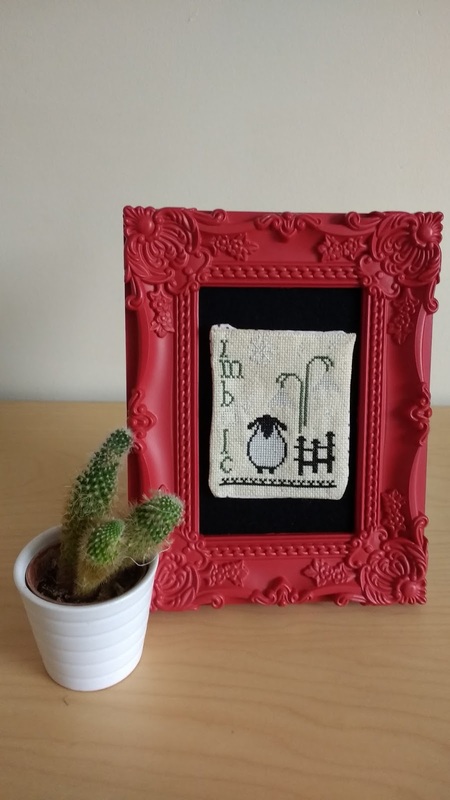 It shows two of the most important symbols from Imbolc, a snowdrop and a sheep. It is made in Aida rustic 18 count. The other design is from CTdesign and I bought it in Etsy. It is made in Aida navy blue 14 count with white and gold metallic threads and represents snowflakes and candles.